Lucas Pope, the developer behind Papers, Please (one of our favorite games of 2013), has released a very early playable chunk of his next game. 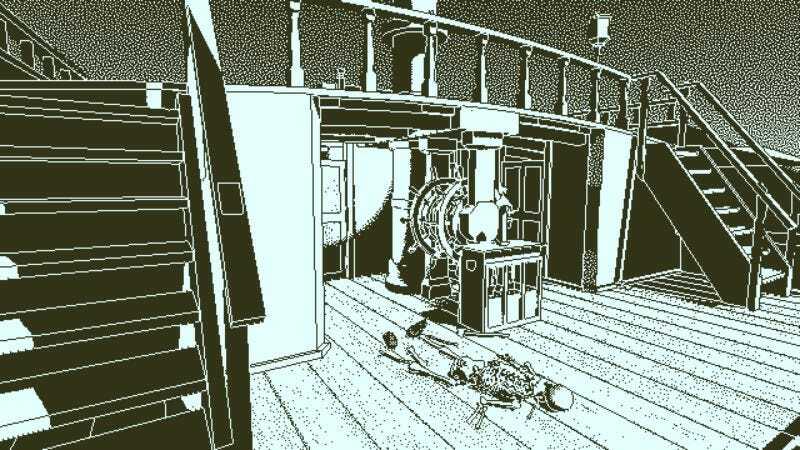 The project, titled Return Of The Obra Dinn, puts players in the role of a turn-of-the-19th-century insurance adjustor attempting to figure out what happened on the Obra Dinn, a merchant ship that was thought to be lost at sea but drifts back into its London port six years after beginning the fateful trip. The only sign of the crew is a few skeletons. Luckily, the East India Company packed your luggage with something that’ll help figure out how those skeletons got there. Besides being a sort of historical-fiction period piece and casting the player as a pencil pusher, Return Of The Obra Dinn is a divergence from Papers, Pope’s breakthrough game. It’s a full-on 3D first-person game, giving players the freedom to wander the ship and look for clues. “I’m hoping to capture a compelling mystery with suspense and twists in the limited space of an old merchant sailing ship,” Pope wrote in the first post of the game’s developer log on the TIGSource forums. He also describes the aesthetic as inspired by “old Mac games” like Dark Castle or Uninvited, the kind that drew their cartoony graphics with monochromatic dots. He’s building a fuzzy 3D world using the same techniques, and the single big play twist, which we won’t divulge here, allows Pope to build exciting cinematic scenes that find strength in the art style’s limitations. This first playable taste lasts around 15 minutes, but it’s enough to get a good idea of what Pope is aiming for. He hasn’t announced his release plans, but all signs point to the full game still being a ways off.